About a year ago I was approached by Dr Jennifer McFarlane, the curator of the Arts in Health program from the ACT Government, who was putting together some artwork for the new University of Canberra Hospital which was then under construction. She was particularly interested in images which would connect people with the local wildlife and bush landscape. One thing led to another and I was asked to pull together a suite of photos which would recreate the feeling of going for a bush walk in the Brindabellas. The hospital opened in mid-June and my set of photos are hanging in a corridor near the cafe/reception area. The photos in this post are courtesy of The University of Canberra Hospital: Specialist Centre for Rehabilitation, Recovery and Research, with photography by Adam McGrath. This was the first time I’d been involved in a project like this and the process was, at times, a little daunting. Jenny was particular about each of the images being luminous, positive and calm, and conveying a sense of wonder at the beauty in nature. I also wanted to include photos from a range of different wildlife - birds, animals, plants, the landscape… And of course the images all had to work together too, as a collective whole. Many thanks to Jenny who was supportive throughout the whole process. My favourite part was seeing the photos roll off the printer. Stephen Best (Macquarie Editions) did all the printing for this and he was very generous in sharing his knowledge about the printing process, how to prepare photos for printing, ensuring accurate colours and tones, and the range of different papers available. It was particularly satisfying watching the big panorama roll off the printer… it was 2.4m long and took over half an hour to print. That’s a lot of paper! The photos were printed on Canson Infinity Baryta Prestige which did a beautiful job of rendering the brilliant colours in the birds and bush scenes. 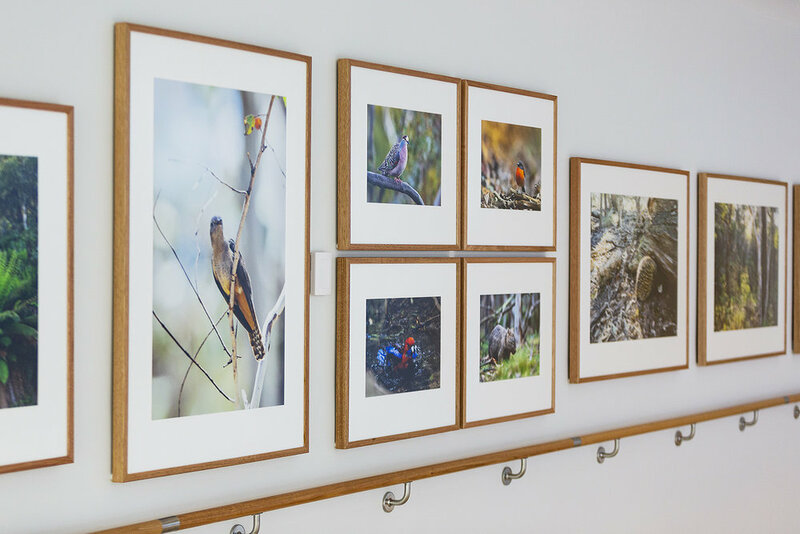 The photos are framed with beautifully simple Tassie oak frames which give a warm feel to the whole set. The whole building is quite amazing actually, it’s covered in heaps of cool artwork from local photographers and painters and other visual artists.